Located just 37 km north of Houston’s central financial district and between U.S. Highway 59 and Interstate 45 with direct access to the Hardy Toll Road the George Bush Intercontinental Airport (named in recognition of the 41st US President George H. W. Bush) with scheduled flights to domestic and international destinations is a United States Airspace Class B airport serving the fifth-largest metropolitan area of Houston. George Bush Intercontinental Airport has three main terminal entrances. The first entrance and most used is the John F. Kennedy Boulevard main north-south expressway which intersects Greens Road. The second entrance is by way of the east bound Will Clayton Parkway which is connected to the U.S. Highway 59. The third entrance to the airport is by way of the Hardy Tollway Connector which connects the JFK Boulevard to the Hardy Toll Road. In terms of the number of international cargo flights handled George Bush Intercontinental Airport is ranked as the 12th-largest gateway in the United States and can handle as much as up to 20 wide-body aircraft. George Bush Intercontinental has five terminals situated on a total of over 101 ha with a distance of 2.4 km between Terminals A to D.
Terminal A which was opened in 1969 has a total of 20 gates, 10 of which are located in both the North and South Concourse. Terminal A is used by all non-United domestic and Canadian flights as well as a few United Express and international departures. Mush similar to Terminal B, Terminal A featured four circular modules known as Flight Stations located at the end of its corridors. Between the late 1990s to early 2000s Terminal A’s North and South Concourses were remodeled to linear facilities for smoother operations at the terminal. Serving most United Express and domestic operations as well as international departures Terminal B is one of two of the airport’s original terminals to open in 1969. Terminal B which is today solely used for United Express commuter flights has 37 gates and 20 hardstand gates. Terminal C the third terminal to open at the airport often referred to as the Lewis W. Cutrer Terminal serves as the primary hub for United Airlines as well as a domestic operations and international departures for United Express. 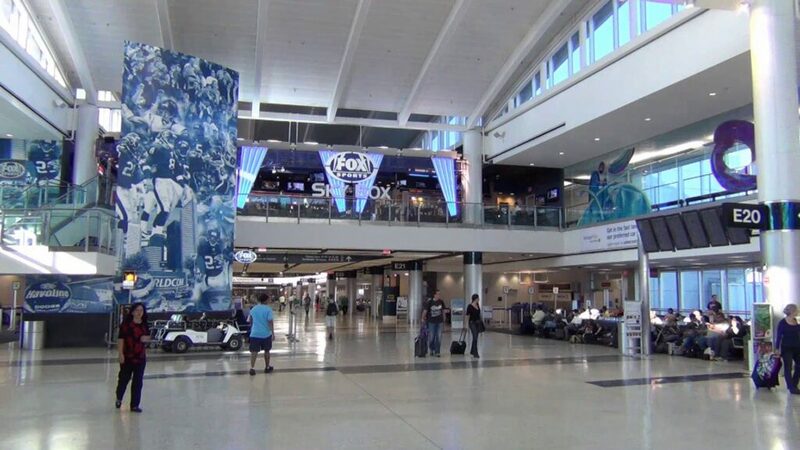 George Bush Intercontinental Airport operates two United Clubs at its Terminal C. The first is located by the terminal’s gate 33 in the South Concourse and the second at gate 34 located in the North Concourse. Terminal C has a total of 31 gates and houses an interfaith chapel. In 2015 the airport broke ground on the north concourse of the new Terminal C scheduled for completion in 2017. Mickey Leland Terminal also known as the airport’s Terminal D is used by all non-United international flight operations as well as a small amount of international arrivals served by United Express. Terminal D was officially opened in 1990 as the airport’s International Arrival Building. Terminal D which was later renamed the Mickey Leland International Building contains a Federal Inspection Facility and US Customs service. Before Continental moved its international flights to Terminal E Terminal D was used to consolidating all the airport’s international arrivals into a one terminal. Terminal D airlines operate by way of a “common use facility” (the first in the United States) sharing gates, check-in counters, and terminal equipment. Terminal D has a total of 12 gates, a food court in its departures area as well as several international lounges including an Air France, a KLM Crown and two separate Galleries Lounges used by for British Airways. In 2014 the Houston City Council announced its plans to demolish the Terminal D building in favor of a new modern designed facility consisting of gates capable of housing 15 large wide-body jets such as the A380 Airbus. Terminal E (the airport’s newest terminal) of the George Bush Intercontinental Airport serves as the major hub for all international operations of United Airlines as well as for a few larger mainline domestic operations. Designed for maximum flexibility to handle any aircraft Terminal E has a total of 30 gates. Terminals A, B, C, D, E and the airport’s International Arrival Building is served by way of a people mover system known as a TerminaLink used for persons traveling by way of connecting flights in different terminals. The TerminaLink system which allows passengers to travel within the airport without the hassle to re-enter airport security has four stops at Terminals A, B, C, and D including a stop at the International Arrival Building. George Bush Intercontinental Airport has an on-site hotel Marriott Hotel. The hotel which contains 560 rooms, a conference center, two restaurants, a coffee shop and a cocktail lounge is located between Terminals B and C and is accessible by way of the airport’s TerminaLink. Passengers commuting to the south side entrance of Terminal C from Downtown Houston were once able to travel by way of the Metropolitan Transit Authority bus service at a cost of between $4.50. However by 2011 that service was discontinued due to a reduced cash flow and operation of the service at a financial loss. Several Hotels in the Houston area are known for operating courtesy vans which can be used to request pick-up at the airport. These courtesy vans can be reached by way of courtesy telephones located in the airport’s baggage claim area. The Houston Can Academy is 16.8 miles south from the George Bush International Airport. The link below taken from a Live WeatherBug website shows the traffic and weather conditions around the college. View Houston Can Academy webcam. Located 23.3 miles just south of the George Bush International Airport, the University of Houston – Main Campus Webcam provides an above view of the campus overlooking the Houston Downtown area. View The University of Houston – Main Campus webcam.